Got any blacker? 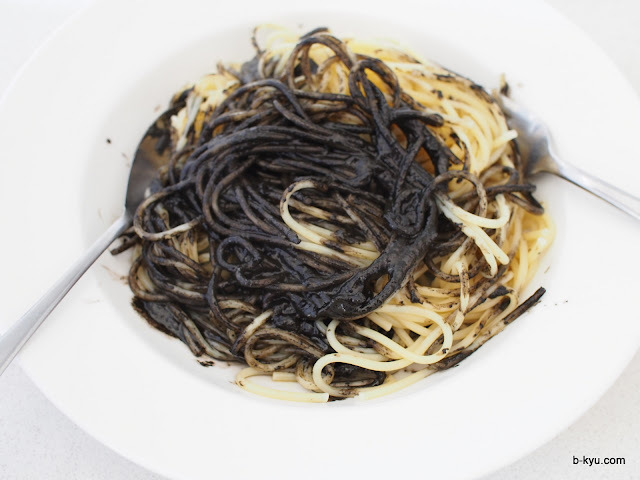 You can't get a better black coloured food than Japanese ikasumi (squid ink) spaghetti. If we were catering a Halloween party, this skeddi sauce would be number one on the menu. It's blacker than Morticia's hair and more scary than a Daryl Somers come back. 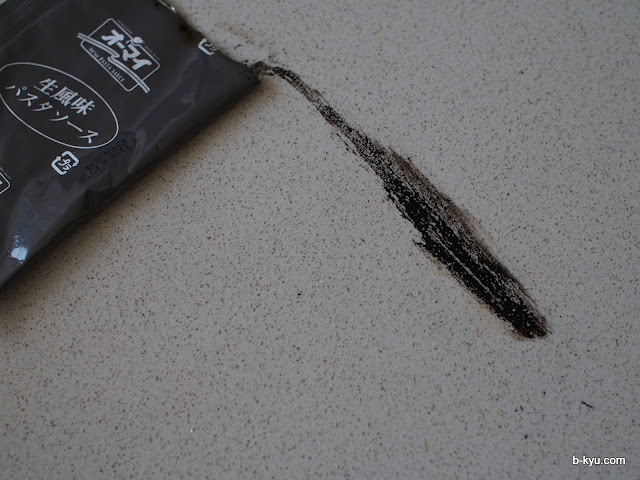 It's also covers off a number of our favourite things: it's cheap, easy to make and comes from Japan. Ikasumi is popular in Japan as a colouring agent for food, like black hamburgers. As you can see from the ingredients list above, there's not a huge percentage of squid or fish in the mix. It probably doesn't take a large amount of squid ink to colour, so perhaps it's not that necessary to be top of the list. 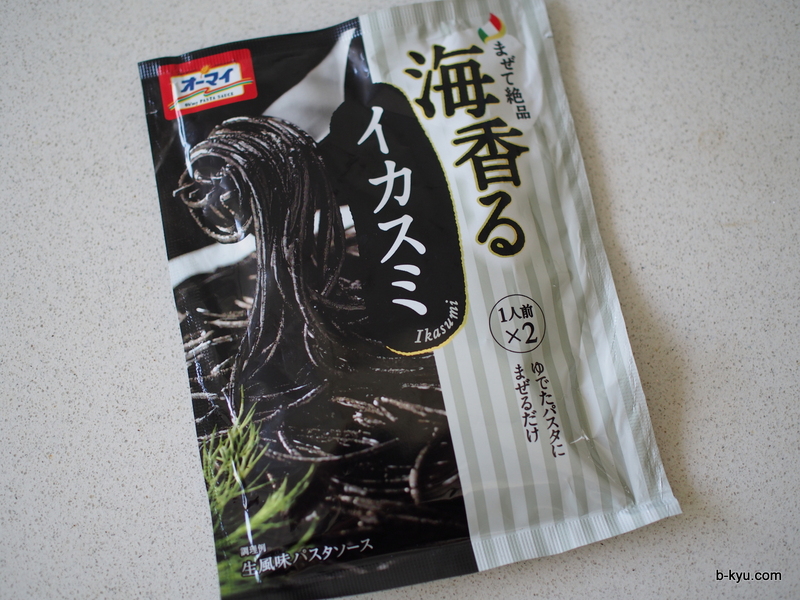 It also has MSG, so if you don't want to eat this much maligned additive then don't eat this. 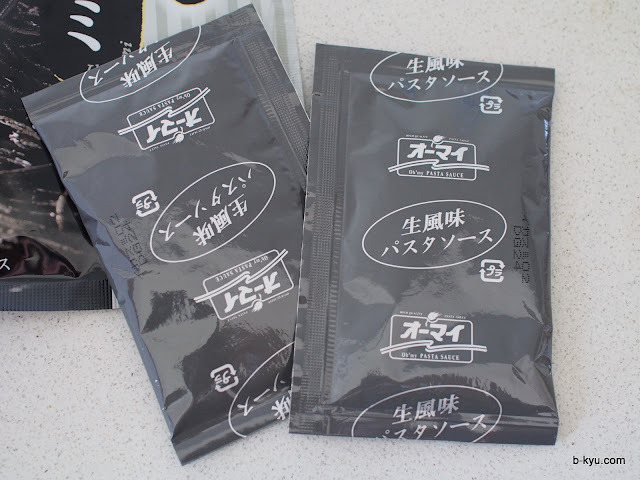 Inside the packet are two smaller packets, one for each serving. 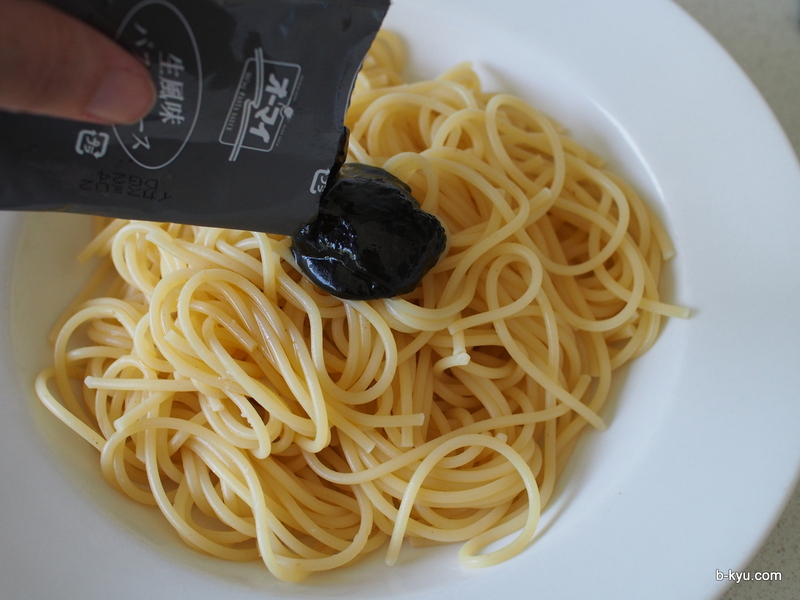 The amount of sauce in one packet is generous for a standard serve of pasta. We used Barilla pasta, our favourite cupboard standby. Not only does it give a good bite, it comes in a cardboard box for better recycling. 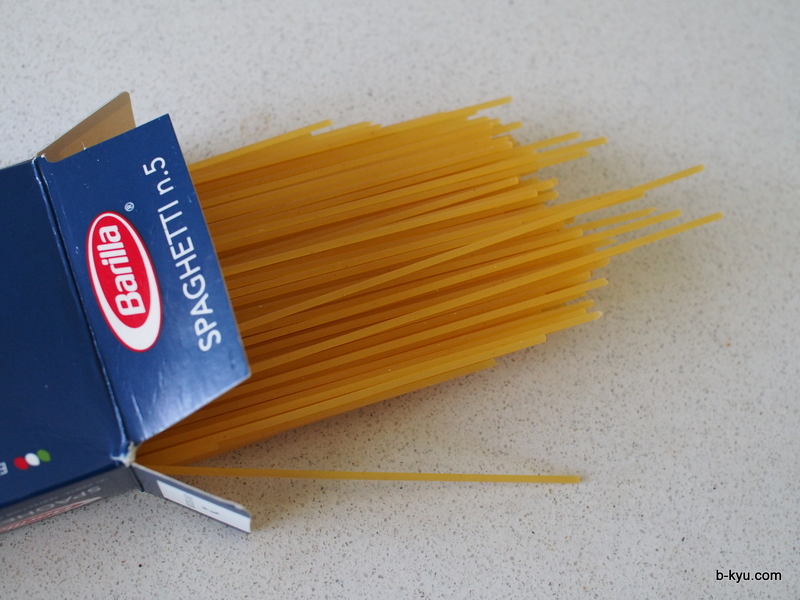 Once you have cooked the pasta, open the packet and pour on top. A small amount of oil will come out first, then the black goodness. 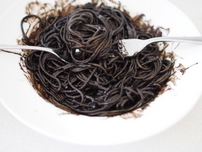 Best to do this in the bowl you will be eating out of because this gets black and very messy. Start stirring through the sauce. I also added a little of the pasta cooking water to help mix it through. Once mixed through, serve away. One packet gave good coverage of a serve of pasta. The flavour was salty and strong, a very intense fishness. If you wanted to up the fancy stakes then you could add some cooked squid pieces. Watch out, this stuff can get over everything, including your teeth, lips and cheeks depending on how hearty a spaghetti slurper you are. 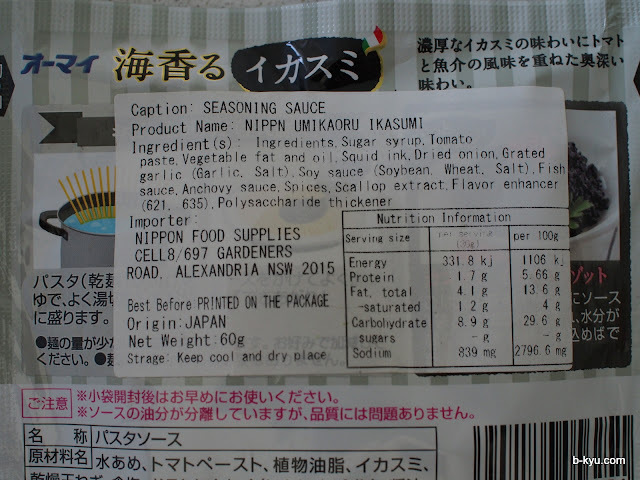 We found this packet at the Conbini 8 store in Town Hall, Sydney for a few dollars. Look for it with that other great skeddi sauce, mentaiko, but save that for when you need something pretty in pink. Whoooa, I want to get my hands on some of this!